A woman is found murdered in the woods with a very special watch on her wrist - and what seemed a simple case soon escalates into a nightmare. The criminal methods of some of the most infamous killers of all time are being replicated by a new predator who stalks and strikes victims with a cunning brilliance. No one can understand the murderer's motives or who the next victim will be. Drawn into this violent affair are two Secret Service agents turned private investigators, Sean King and Michelle Maxwell. Both have been hired to prove a man's innocence in a domestic burglary involving an aristocratic, if dysfunctional, family. Soon stunning secrets will lead the partners into the middle of a frantic search for a killer unlike any they've confronted before. As the Hour Game barrels forward, Sean and Michelle face a macabre puzzle and uncover one horrifying revelation after another. Nearing the truth, they will find that their own lives are in danger. And then they're hit with the biggest surprise of all. 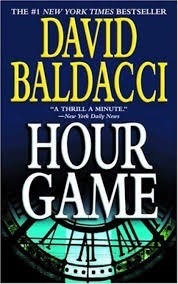 When you play the Hour Game, you have to play to win. But time is running out... for all of them.